Good students interested in science, math or social science (STEM), who are accepted into the School for Science and Math at Vanderbilt then spend one day a week during their high school years on the Vanderbilt campus working on projects and in laboratories with Science, Technology, Engineering and Math professors. 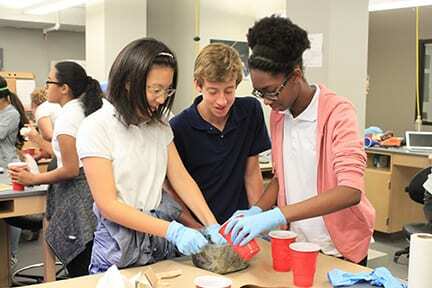 “The School for Science and Math at Vanderbilt is a high school program that is an immersive interdisciplinary STEM program on the Vanderbilt campus,” Said Amanda Dixon, Admissions Coordinator & MNPS Liaison for the program. “Over the course of four years [of high school], students get to experience a wide breadth of research, and exposure to STEM subjects — everything from psychology, marine biology, physics, anthropology, [computer] coding, and medicine,” said Dixon. “We have a group of three dedicated scientists — an engineer, a molecular biologist, and marine biologist — who spend time with students on specific projects. Over the course of four years they will interact and meet over 50 people in STEM careers,” said Dixon. The program includes summer study where students study and work in laboratories for three weeks following their sophomore and junior years and six weeks on an independent research project following their senior year. “We just had a student who was a semi-finalist in a Siemens competition. We also recently set up a tropical aquarium in our classroom,” said Dixon. Students who apply should be performing well as students, complete an online application (which includes an essay) and have recommendations from teachers. “We read every application and then interview a portion of those and ultimately accept 26 for the next freshmen class,” said Dixon. Students accepted into the program will use MTA buses to get to Vanderbilt. Dixon emphasizes that it requires commitment from both the student and the student’s family. That end goal is to provide students with mentoring for future studies and careers in STEM. Students in the program earn seven elective course credits and possibility of earning advanced elective credits. The program started in 2007 with the goal of furthering science education in Metro Schools.